All cities offer a diverse range of exquisite beautifies with its own unique scenery of stories and touching moods in its culture. If you are planning a culture trip to Taipei, the capital city of Taiwan, there are so many attractions such as the culture landmarks, delicious food and hustle and bustle night markets. However, you may not know, it is also the home of many beautiful bookstores both chained or independent. Whether you like the commercial atmosphere of a big chained store that is 24 hours open; small bookstores that are most friendly and cozy; or a tranquil moment of reading in the rustic atmosphere over a cup of tea/coffee, the city has it all. This has been one of the well-known chained book stores since its establishment in 1989. It inspired people to enjoy reading in a relaxing style. If you walk into one, you’ll find people sitting on the floor and indulging themselves in their reading world and not being pushed to buy any of the books. One store opens 24 hours allowing readers to read at all times. This bookstore specializes in language books particularly English and Chinese. It has been well-beloved among English teachers, students, and expats since 1952. Japanese franchised bookstore – aka one of the most beautiful bookstore in the world opened its first overseas store in Taipei last year. It’s a “book and café” themed bookstore with an elegant ambiance selling not only Chinese, Japanese, and English books but also music albums and DVDs, coffee, cocktails, and the brand’s selective stationery. This unique bookstore offers a combination of books, art, and organic centered food & beverages all in the same place. Shadowed under an old mango tree in urban atmosphere. A good way to spend a lazy afternoon of coffee, sandwiches and a good book. A bookshop committed to anything travel-related. Among the map-decorated walls and souvenirs picked up from past travels, visitors can find a wide selection of travel books. A good resource to build travel wish lists, or plan an upcoming adventure. The friendly staff members are also helpful sources of information and are happy to provide tips for tourists. This bookshop is the perfect escape for backpackers or anyone with a passion for adventure. 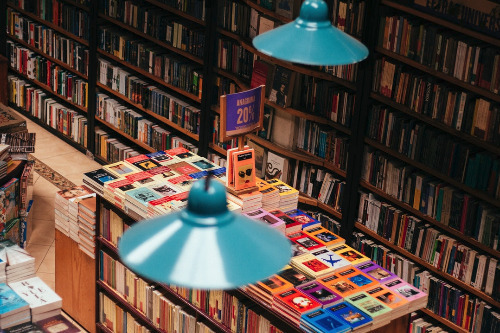 The store is located in an area known more for its historical streets and is one of the few bookstores in Taiwan that focuses mainly on detective novels. Its shelves are completely stocked with murder and mystery novels. Separated into two floors, with first is dedicated to a cafe with typewriters and comfy armchairs that can only remind one of Sherlock Holmes. Murder Ink is also filled with many British or Japanese detective novels among the usual Chinese mystery books. A very interesting and relaxing place where you can get a cup of coffee and transport yourself into the middle of an old spy novel. Established in 2016 with the goal to inspire people to enjoy reading over 3C devices (no free Wi-Fi available in the store)! All books are non-for sale! Over 3000 book selections for all readers to read freely and all you can drink bars are provided with $100 entry fee to visitors above 12 years of age. A store with great selection of second hand books and is considered the king of used book stores. This popular used book store chain has four locations throughout Taipei and carries used English and Chinese books as well as second hand CDs and DVDs. Soft music playing in the background lends a calm atmosphere to the shops, and visitors can sip coffee as they get lost in the well-stocked aisles. Visitors can also bring in used books to sell or exchange. A for good value books with paying less with good variety of English novels, children’s books. Books are mostly well-maintained. Variety of used books. Most of the books are in almost brand new condition with great price. They have two locations in Taipei and New Taipei City.